NEW DELHI – — It was already dark when we made our way from Indira Gandhi International Airport to Nizamuddin East, one of this capital city’s safest neighborhoods. Electricity is erratic and expensive so New Delhi’s authorities don’t spend a lot to light the highways and boulevards. But through the smudged windows of our taxi I noticed a dun-colored dog, thin and rangy, dart in front of traffic. Then I saw another dog, darker, also bony and long-legged, race from one side of the street to the other. Very quickly it became apparent that the streets were full of dogs. Collarless. Dull-coated. Silent in a way strange to an American accustomed to dogs that bark at every little thing. In the morning I took a long walk with Aubrey Parker, my colleague at Circle of Blue, and the full extent of New Delhi’s canine carnival became clear. Put it this way. Stray dogs are everywhere here. Lying in the sun at street corners. Pacing the sidewalks. Nosing around garbage piles. I love dogs. I rescued one from a highway in Virginia and she lived with me for over 18 years. Here, though, I felt menaced. Dogs are pack animals and there is no way I’m taking a daily long run through the streets of New Delhi, the first time in decades of national and international travel that my running shoes haven’t made it out of my suitcase. New Delhi isn’t just the worst running city I’ve ever visited, it’s a city where you can’t run because of the real risk of being attacked — by dogs. No lie. It’s nuts. Three years ago New Delhi tried to count its stray dog population and came up with an estimate of 262,000 dogs roaming the streets. That’s about one stray for every 75 people in this city of 20.4 million. 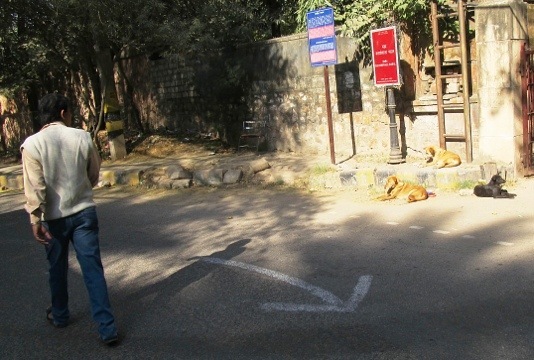 Stray dogs have overrun Nehru University’s 1,000-acre campus, where 20 students were attacked and bitten earlier this year. Rabies outbreaks are common in India, where stray dogs also roam other cities, and where 20,000 people die each year of the disease. That’s a third of the annual rabies deaths worldwide. Pedestrians here regularly complain of being attacked by dogs roaming alone and in packs. I’ve been here four full days now and I haven’t seen a single jogger. The fitness and sports clothing stores feature jackets and sweat pants, not shorts and running shoes. If you dig deep you wonder about the principles and values of a society that allows, even encourages such a dire risk to community safety and health. It’s almost Republican in its religious and delusional dimensions. Here’s the religious component. Hindus, who make up 80 percent of India’s population of 1.2 billion people, oppose killing animals. 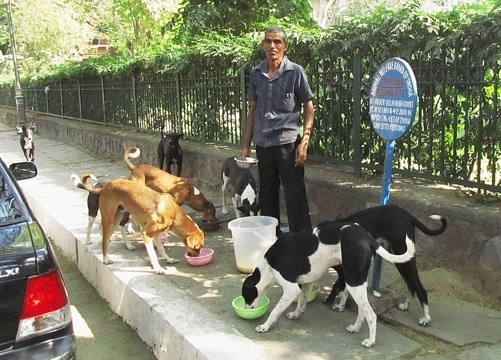 And here’s the delusional piece: While strays in New Delhi and other cities enjoy the voluntary care of neighborhood hosts, tens of thousands of human residents here live on the streets. Adults send their children into heavy traffic to tap on car windows and beg for coins. Toddlers in dirty cloth diapers crawl out from sidewalk hovels made from stacked bales of trash with plastic sheets for roofing. A crippled young woman, stricken with polio and missing both feet, drags her body along the sidewalk using just her arms. Strays are cared for. Meanwhile, we learned yesterday, all across India infant girls are murdered by families who can’t or won’t pay the cost of a marriage dowry, which now are illegal in India.